* Bravo Farms. Bravo farms is off the 99 about an hour-ish outside of Fresno. If you are looking for it you really can’t miss it. The only things located on that exit are a gas station and Bravo Farms, plus there are a zillion signs warning you of the fun you will miss if you choose to pass without stopping. When I go up to see my sister, Riggins and I always try to stop there for a bathroom break, lunch/dinner, and to stock up on yummy cheese (to be used later in the trip). They have a very cool saloon style dinning room and bar. The back is covered in fun things to look at and purchase along with a dozen or so live animals for the kids to gawk at and Riggins to bark at. The cheese is super yummy and can actually be found in specialty stores in LA. Why not just get it from the source? I’ve eaten with Riggins on the edge of the outside dinning room and also in the back at a picnic table. They are pretty tolerant of dogs … although I have to usually ask for help ordering, getting him some water, etc. Don’t miss it. It’s worth the bathroom break stop, if nothing else. * Hiking. As you can imagine, since Oakhurst is so close to Yosemite there are a ton of trails. Oodly enough I haven’t been on many. It can snow there in the winter and it is 100+ in the summer. Those are the two times I’m usually in town and I don’t do extreme weather. 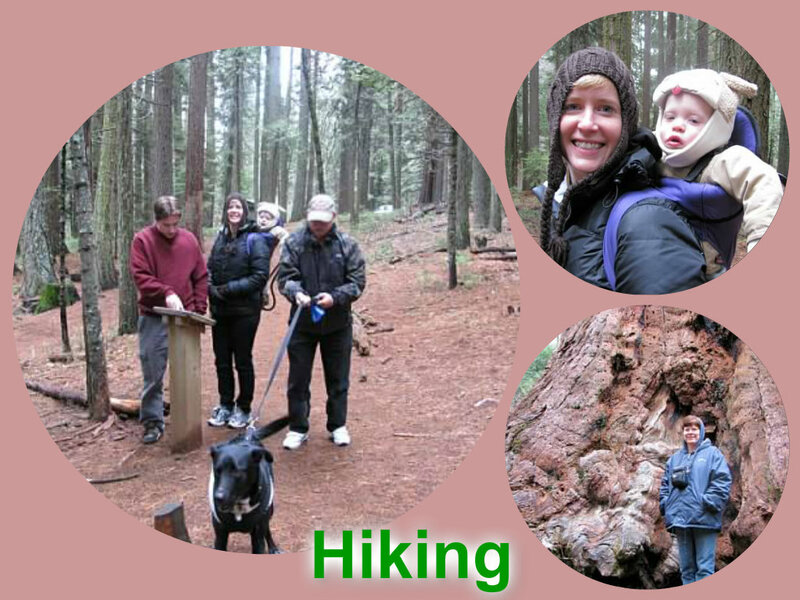 Once, when Logan was a baby, our family went off on a trail. Logan was on my back and we were leading the pack. All of a sudden it started snowing and I screamed, did an about-face, and headed back to the car! If you can brave weather better than me then check out some of the trails. There is a little path in Oakhurst that I run on when I’m there and usually spot a deer or other wildlife. It’s very pretty … nature and stuff. * El Cid. I love Mexican food and margaritas. 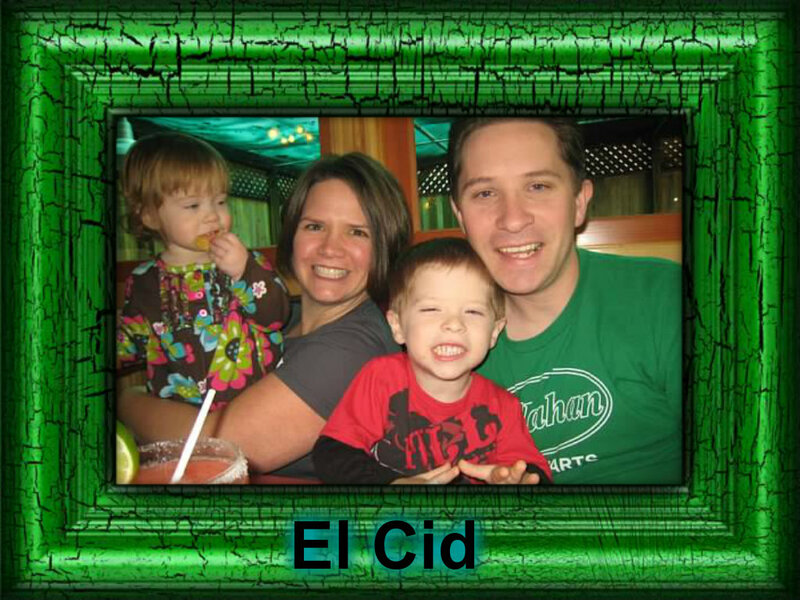 There are many Mexican joints you can check out by I suggest you head out to El Cid. It’s a nice family restaurant with yummy drinks and guacamole. You can sit near the back windows and watch the finches come up to the feeders. If I’m up there you know we are going to eat at El Cid at least once! 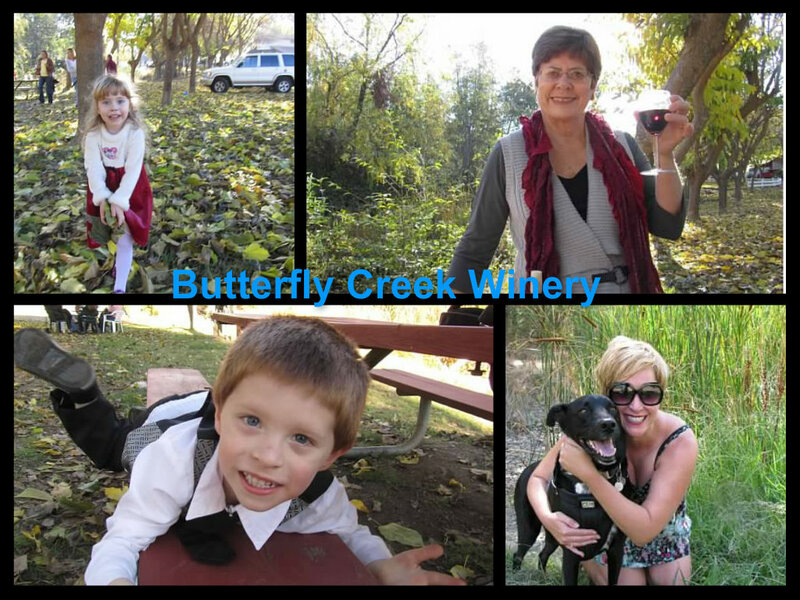 * Butterfly Creek Winery. All they way from Fresno to Oakhurst you will see signs for wineries and, if you are anything like me, you will be ready for a drink after that drive. My absolute favorite is Butterfly Creek Winery (I’ve been to a total of 2 so I’m in a really good position to choose a favorite in the area). It’s outside of Oakhurst about 30ish minutes. You go around some mountains, down into a kind of valley of sorts, and down a private road. From there you bump right into a sweet little winery. It’s kid and dog friendly and I always let Riggins wander around off leash with the winery house dogs. It’s right by a creek (I’m going to assume “Butterfly Creek”) and a perfect picnic place. Of course you can try out the house wines and chat with the owner but I suggest going right to buying a bottle and enjoying a picnic (remember the cheese from Bravo Farms?? This is where it comes in handy) out at one of the picnic tables. There is a winery in “the town” of Oakhurst next to the “river” (about as river-y as the LA River). It’s not as kid and dog friendly (they are allowed there — I think — it’s just not as much fun for them) but it will do in a pinch! The wine is a little more expensive but it is mighty tasty and you can sit out on their private patio and enjoy the company of others or perhaps some mountain musicians. I don’t know the name of the place. I call it the Lesbian Winery. I don’t mean anything negative by that label. All my lesbian friends are super nice … so I assume these folks are too. I don’t suggest you ask people for directions using that name though. For one it could be seen as insensitive and secondly I have no idea if it is factually accurate at all. 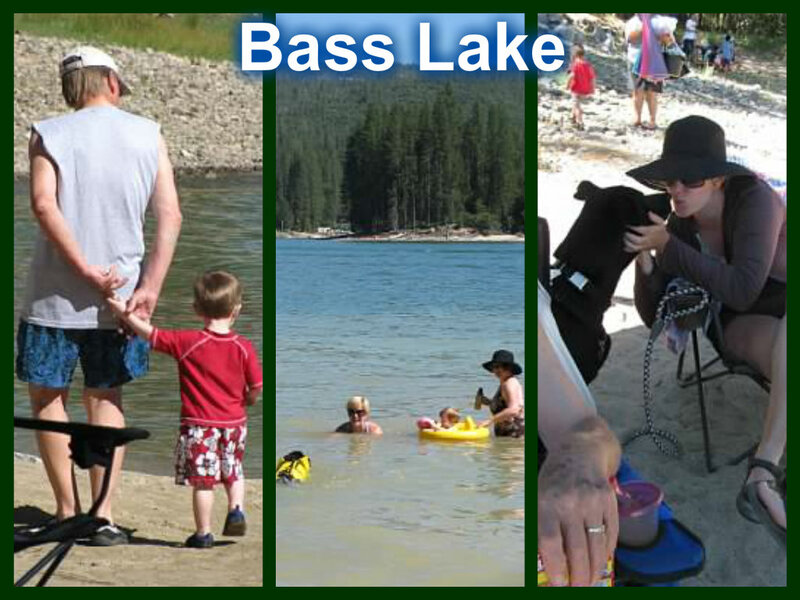 * Bass Lake. About 20ish minutes away from Oakhurst is Bass Lake. It’s a cute lake with cute lake places to visit. My family has spent a few 4th of Julys camping at Lupine campground and love it. The lake itself is fun to swim in during the summer and pretty to look at when it is frozen over in the winter. Eat at The Forks. It’s a sweet little diner-y place on the opposite side of the lake of most of the stores/restaurants. Like most places in Oakhurst it has grown a lot since I first went there. My first visit I asked for a glass of Cabernet and had to explain that was “the red one.” I don’t think you have to specify anymore but beware, if you want sparkling water you are out of luck! * Sugar Pine Railroad. 20ish minutes outside of town you will find a very cool railroad. It will take you on a 4ish mile loop with a quick stop in the middle. It’s a real live steam engine that runs on some of the old logging tracks (honestly that last line could be all fiction … I think it’s true but don’t quote me). The engineers will tell you some history on your ride and it’s something fun for kids and adults. That’s it. Once you hit those places you can head back to the big city!